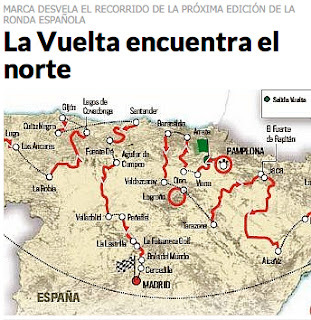 Today the Spanish Newspaper MARCA reported that it had accessed the 2012 route prior to the official release, and of course they published it. As you remember the routes of the Tour de France, Giro d'Italia, USA Pro Cycling Challenge, and probably a few others were leaked prior to the official presentations. 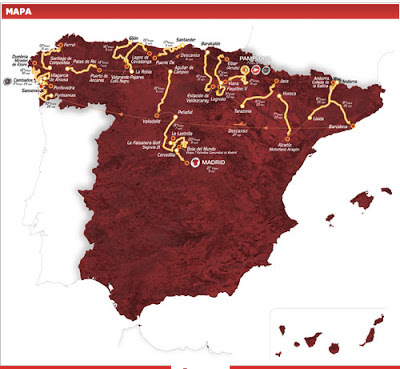 The official presentation of the 67th Vuelta a España is planned for tomorrow, Wednesday, January 11 at 12:00 at Baluarte (Pamplona), Palacio de Congresos y Auditorio de Navarra. The 2012 tour is confirmed to begin in Pomplona on August 18th and finish in Madrid on September 9th. We'll have to wait until tomorrow for the exact route details and stage lengths and profiles. Update: the real story from CyclingNews.com on 11 Jan 2012: 2012 Vuelta route revealed. Official website of the Vuelta a España. Read the complete article on MARCA The Tour is North (in Spanish). The newspaper reports: "Specifically, the seven major goals of the Tour 2012 are: Arrate, Valdezcaray, Coll de la Gallina, the goal will be on-Canolich Sanctuary, Los Ancares, Lagos de Covadonga, Cuitu Black (ramps of up to 25%) and Bola del Mundo. To these we must add the other three stages ending in ledges or third ports: Fort Rapitán in Jaca, and the Mirador de Ézaro, in A Coruña, in addition to Fuente Dé, who, at the foot of the Picos de Europe, is one of the most beautiful Cantabria."